Add to my favorite sellers. 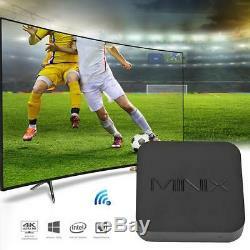 MINIX NEO Z83-4 Smart TV Box Windows10 Mini PC Quad Core 4G+32G WIFI 1080P Bluetooth HDMI Media Player Feature: 1. Intel x5-Z8300 quad core CPU is fast and stable, which can provide you with high speed feedback and stable response. For Intel HD Graphics: image processing is also very powerful. The system adopts 64 bit Windows 10 stable and smooth system to provide you with high-definition pictures and videos. 4GB DDR3L RAM + 32GB eMMC 5.0 ROM: easy to enjoy many games and movies. 2.4GHz / 5GHz WiFi standard: IEEE 802.11ac, easy to connect the world without wires. 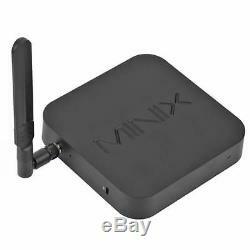 Specification: Brand: MINIX Model: NEO Z83-4 Plug type: EU Type: Mini PC GPU: for Intel HD Graphic System: Windows 10 CPU:Intel Atom Cherry Trail x5-Z8300 Core: Quad Core RAM:4G Type RAM: DDR3L ROM:32G Color: Black Decoder format: H. 265 Video format: 1080P, 4K, 4K x 2K Audio format: AAC, ACC, WAV, WMA Supports 5.1 surround sound output Support 5G WiFi: Yes WIFI:802.11 AC Bluetooth: support Power: charging adapter Interface: 3.5mm audio, DC power port, Ethernet, HDMI, Mini DP, TF card, USB2.0, USB3.0 Antenna: Yes. Language: Multilingual HDMI version: 1.4 Supporting external subtitles: no System bit: 64 bits Preloading: no Power type: external power adapter mode Power adapter output: 12V 3A Note: Please allow 1-3cm differs due to manual measurement. Due to the different display and different light, the picture may not show the actual color of the item. 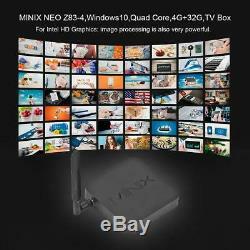 1 x Smart TV Box 1 x Antenna 1 x Power Adapter 1 x HDMI Cable 2 x User Manuals. Please contact me before you return it.